After church on Sundays, my parents would go shopping at the local Asian markets for groceries when I was a kid. I loved it when they took us to the Japanese stores because they had Japanese bookstores there that I could browse as I waited. Once when I was ten, while waiting for my mom to shop, my dad found me reading an Anpanman comic/storybook. Seeing how much I liked it, he bought it for me. I poured over that simple children's book over and over, mostly because I think I just loved the world that Takashi Yanase created. The simple story lines and colorful drawings still pull me in today. 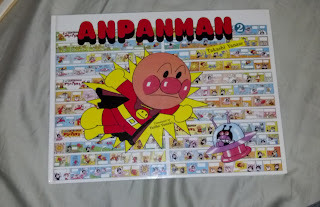 A majority of my Orchard Heroes inspiration comes from these stories of Anpanman and his friends. This was the stuff that made me smile as a boy. This book was volume 1 out of 3. I remember returning to the store a few weeks later and discovering that they had sold out. I've regretted not buying the other two books for years. Ever since I was old enough to realize that there were two more volumes out there, I would spend time browsing every asian bookstore that I've ever been in, looking for volumes 2 and 3 of the series. With the internet, Amazon and Ebay, you would think locating these books wouldn't be that difficult, but THEY ARE! The books went out of print back in 1990 and are extremely rare. For almost 20 years, I've searched online and browsed through bookstores from Los Angeles to Taipei looking for these books that perhaps ignited something artistically pure and innocent inside me. I had almost given up the search in recent years, but last week out of pure random chance, I came across a website that had a description of a book that might have been what I had been searching for. A used bookstore in New York listed the book, and 19 years, 2000 miles and 10 dollars later, I was able to relive that childhood inspiration. I have the rest of my life to find Volume 3, and I hope I still do. Its hard to explain why a grown man would spend so much hope into finding a children's book, but there's something that is captured in the imagination of your inner child that you'll always cherish and never forget. As an adult, if I can get even a tiny glimpse of that moment again, I could spend the next 30 years in that pursuit and still feel satisfied. Here's to making that inner child in us smile from time to time.